All American First Aid & Safety has been a loyal tenant of Sorrento Valley Self Storage for more than 10 years. In that time, SVSS and the All American First Aid & Safety teams have become very friendly and cooperative. 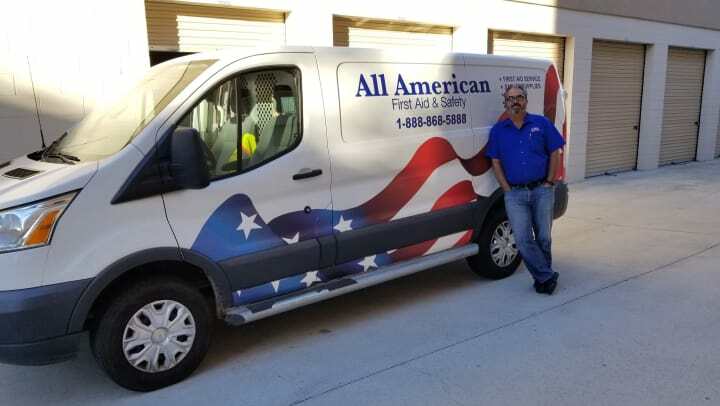 The Facility Manager, Jose Cruz, and all of the storage consultants are always helping to meet All American’s changing storage needs. All American First Aid & Safety’s business is to take care of customers and make sure their employees have a safe work environment. All American delivers everything from first aid & safety supplies to training courses (First Aid & CPR training, Fork Lift certification, Blood Borne Pathogen training, and much more! ), all while helping you stay OSHA compliant. Initially, All American needed help handling back stock of products. Over the years, Sorrento Valley Self Storage has provided additional support. SVSS helps to receive supply shipments and notifies the All American team when larger units become available so the company can better manage inventory.